Walk to Tahoe City, Restaurants & Lake Tahoe, backs to forest, large deck. Dog-Friendly - Hot Tub - Lake View - Walk to Tahoe City, the Truckee River, and the Lake! Fairway Cottage is a wonderful North Lake Tahoe dog friendly vacation rental; a perfect getaway for families and couples. 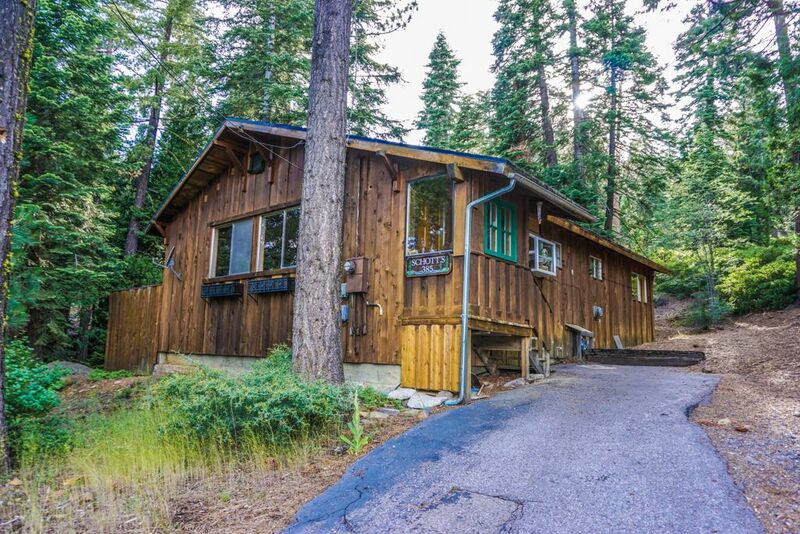 This North Shore Lakeview cabin is just a few minutes from Tahoe City and even though it is quite close to fine dining and entertainment, this rental has a very private back yard backing to National Forest. A short trek uphill from the back of this cabin will lead you to Tahoe Rim Trail which goes all the way around Lake Tahoe. The Cottage offers a large private deck with hot tub and forest views, carpet throughout, and tastefully furnished comfortable living area focusing on the stone hearth and gas fireplace. Bedroom accommodations include a large bedroom with a king bed and French doors opening onto a private deck, and a king bed in the second bedroom. Lodging amenities include quality linens; leather sofa in the living room which folds out to a queen bed; and dog-friendly extras such as dog bed, dog treats, and Tahoe guide book for dog lovers. For Lake Tahoe skiing and snowboarding, this cabin is in close proximity to Alpine Meadows Ski Resort (5 miles), Homewood Mountain Resort (7 miles), Northstar at Tahoe (10 miles) and Squaw Valley (7 miles). Tubing and sledding are available at many North Shore ski resorts or setup your sledding run right in the back yard. For summer lodging guests this rental is nearby golf courses, hiking trails, bike trails, beach access, and boat ramps. Walk to Commons Beach for an abundance of summer activities. This is a dog-friendly house but in order to bring a dog, you must pay a $70 dog fee per dog, 2 dog maximum. We loved the location of this property, walking to Tahoe City and the Lake, backing to forest. The cabin was cute and the lot huge. We love how peaceful it is. Photos must be 10+ years old or photo shopped. Also, walk to town is 20 min and potentially freezing so beware. One heater in main room so bedrooms are also freezing. Sorry about the bedrooms being cold, the heater in the living room does heat the bedrooms if the doors are left open and then for night time there are two electric heaters but for some reason someone had moved them to the entry closet. The main photos are 2 years old and definitely not photo shopped and the bedroom photos are less than a few months as all the linen has just been updated. We would never photo-shop photos, we really want our guests to have a great stay and come back. We even have requirements for our photographers that they do not use any lens that distort the size of the rooms. What we liked: The house was clean and completely prepped for our arrival. The manager was great to deal with and very communicative. The house is well located within walking distance to Tahoe City. Dog friendly, great access to hiking trails and a hot tub. What we didn’t like: There are no blinds on any windows in the house, bath and bedrooms included. The neighbors see directly into the house and you have to tuck into corners for privacy. It also means light coming through at all hours, so if you have kids that need mid-day naps, want to sleep past 5am or not be blinded at sunrise it’s a bit challenging. The house is tired and looks like it’s been band-aided over the years with construction materials from other homes. Mismatched doors, flooring, counters, cabinets, etc. This is more a personal preference. Lastly, it’s great that the house is dog friendly, but the carpet is old and smelled like urine in areas. We opened the windows which helped, but something worth noting. Overall right down the middle. We stayed over the Memorial Day wkd and had a wonderful time. The weather initially was not great and we were thankful for the dvd player. The closeness to town allowed you to walk a few ways into Tahoe City We took advantage of the kitchen which was appropriately stocked. As the weather became warmer we used the deck where the hot tub is located. The place is clean and has a washer/dryer unit. We had a few issues with the refrigerator and television set up and the property management folks were helpful. They managed to solve our problems and checked back to make sure everything was working. Thank you for choosing Fairway Cottage. We pride ourselves on ensuring that our homes are in perfect condition and do our best to troubleshoot quickly and effectively when an issue arises. I am so glad we were able to help. The fridge has been repaired and we appreciate your patience, kindness, and understanding. We can't wait to host you again soon! This is a great little house, that is in a walkable location to the town of Tahoe City! It matched the pictures perfectly. The host was extremely communicative and everything was as they said it would be! My husband, our 2 years old yellow lab and I had a lot of fun in this house, it is nice and cosy, will come back again! Thank you for the review. It is always nice when you can include the fury family members as well. First time In the Lake Tahoe area. What a Place! My family of 5 loved this cabin with it's location. It's close to Squaw valley, the Lake and Tahoe city. It was easy to shop and get supplies. We have three kids 15,13 and 10. This place just worked for us with the large kitchen and living area. The hot tub was great, the snow must have been 5ft deep around the hot tub. It was quite a site to see. The place was clean and the owner was very helpful. We had a great time. I would recommend this cabin to a to all my friends. We will be back very soon. Thank you for the review. It's always great to hear that someone had such a great time at one of our places.